October 27, 2012—Girl Scout Beyond Bars troops 7140 and 7856 unveiled their banner exhibit called “Our Hopes and Dreams for the Future” at the Baltimore Circuit County Court. The project—a series of banners—was created by the troop’s members under the direction of Hannah Brancato, a community artist. During the dedication, girls were invited to speak about their banners and the dream represented in the artwork. Then all were invited to join in a traditional Girl Scout Friendship Circle while the girls were presented with their Girl Scout pins. 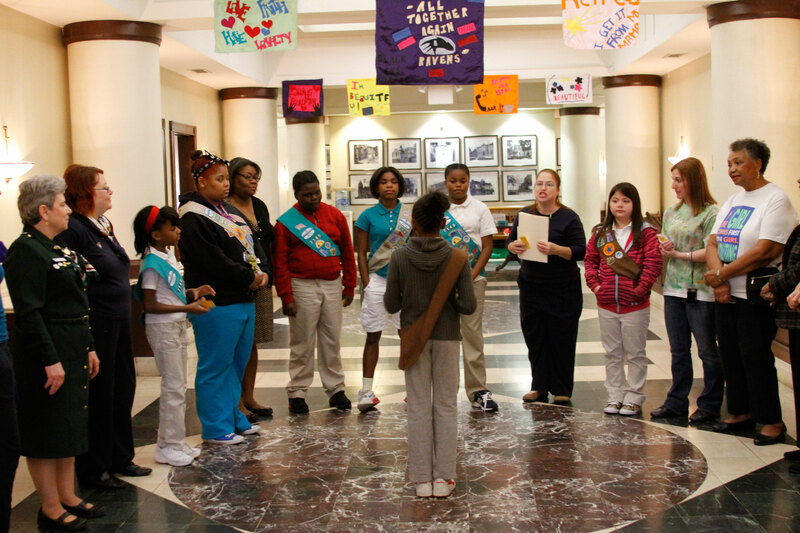 Girl Scouts Beyond Bars is a program in partnership with the Maryland Department of Corrections and the National Institute of Justice that brings Girl Scouting to the daughters of incarcerated mothers. This nationally acclaimed program was piloted by Girl Scouts of Central Maryland in 1992. “The program gave us a safe space to bond,” said one mother, who had recently been released. 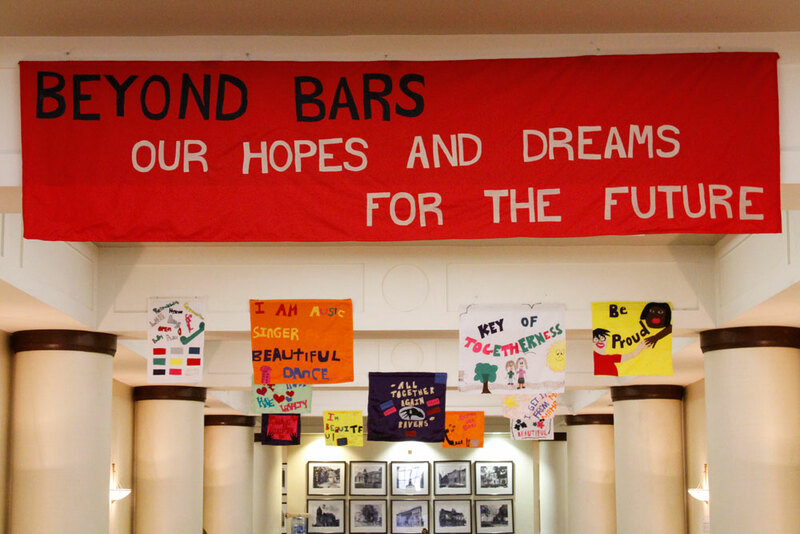 “It was kind of amazing how they invited me into a very close-knit, emotional space,” said Hannah Brancato, the community artist who helped the girls create their banners. “It’s the only time they get to physically be together.” Mothers and daughters created the banners together. Their artwork reflect the themes of advice for girls and what the mother/daughter pair hoped for themselves once the mother is released. 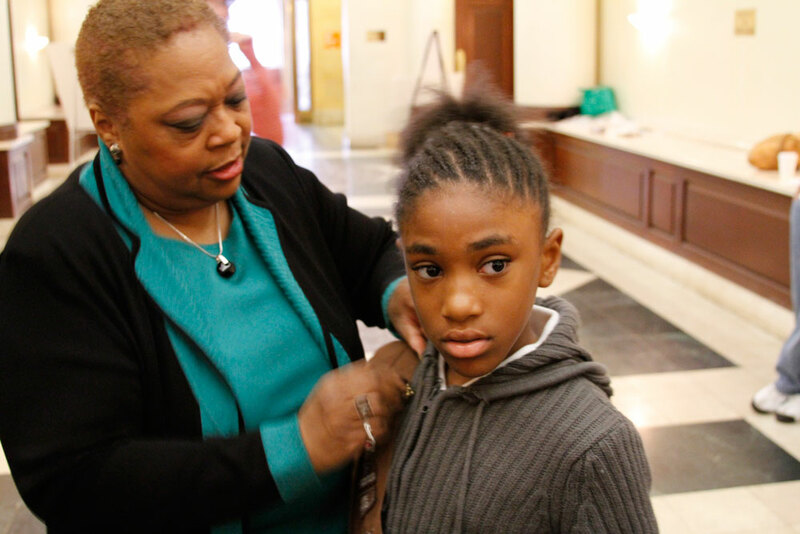 The Honorable Marcella A. Holland pins a troop member during the ceremony. The dedication was attended by The Honorable Marcella A. Holland, The Honorable Yvette M. Bryant, GSCM CEO Traci Barnett, volunteers, friends, family and others.